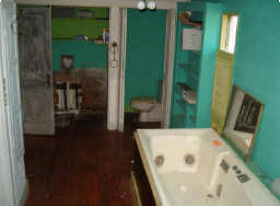 "FEATURES INCLUDE DAY BED, BASEMENT AND BUILT IN SAFE!" I think this is the day bed. Doesn't it look comfy? How uncharitable of her! That door is no more than half mold. Unless mildew counts as mold. Does it? If so, we're back up to 100%. The entrance to that basement makes me wonder if the lambs have stopped crying yet. Crazy paving in the house? Built in solid day bed? I do not understand. - I. Just. Meh? Unfathomable. Also, can you picture the range of nicknacks that would have inhabited the stairwell menagerie? 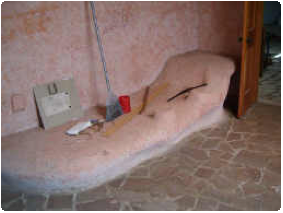 The "day bed" looks like it's made from insulation. wow. a bed made of vacuum cleaner innards. sleep in the safety of your own dust. I can understand terms like no VA, but no FHA? Doesn't that mean toxic waste site or some other problem with the house?